Is this blog still on?? January saw flooding at our Salem home, and me running my first ever 5K race. By March, Jeremy was deep in the interview process with University of Colorado at Colorado Springs, and was soon offered a position there. April was a frenzy of packing and prepping our house for sale, and I somehow snuck in my first half-marathon race as well. At the beginning of May, Jeremy moved into his temporary apartment in Colorado Springs. Just a month later, the Waldo Canyon fire threatened the city, coming less than three miles from his apartment. Our house in Salem also sold in June. I spent July working on my application to the Nutrition Therapy Institute and running my first (and maybe only) barefoot 5K. August saw a new 5K PR and my taking up kettlebells and trail running. In September, I started attending school (courses on anatomy and physiology, and biochemistry of the body) and we began the process of searching for a new home in Colorado Springs; we also had a big surprise. We put an offer in on a house in late October and finally closed the deal at the beginning of December, so that month was loaded with more packing and unpacking. The surprise I alluded to above is that a new little boy will be joining our family this May! I am currently 24 weeks pregnant and everything is progressing nicely. So between my classes, Nolan’s schedule, and preparing for the baby’s arrival, 2013 promises to be no less action-packed than 2012, but I will do my best to record what I am cooking and learning about here more faithfully. In that spirit, here are a few quick little recipes I discovered in the course of researching last week’s homework assignment. We were tasked with our first diet analysis, scrutinizing 7 days of our own diets for the full complement of nutrients. One of my discoveries was that my diet appears to be consistently lacking in potassium, an electrolyte mineral that is crucial for fluid balance and muscle contraction. Low potassium during pregnancy can cause a variety of discomforts, including fatigue, swelling, cramping, heart arrhythmia, or constipation. There are lots of potassium-rich foods that I will striving to incorporate more frequently into my diet, including avocados; baked white and sweet potatoes; winter squash; spinach; Brussels sprouts; and lots of fruits, including kiwis, oranges, pears, and the obvious banana. Today’s star, though, is blackstrap molasses. Not only does molasses have a low glycemic index, it is rich in folate and a veritable powerhouse of minerals: iron, magnesium, calcium, manganese, zinc, and of course potassium. Every one of these is valuable during pregnancy, so I assigned myself the task of becoming more comfortable with the pungent depth of blackstrap molasses, which has never been a favorite flavor of mine. After sampling my first warm cup of spicy molasses-laced milk, however, I realized that this task will be much less daunting than I first supposed! Warm milk until steaming; thoroughly stir in remaining ingredients. Particularly relaxing to drink in the evening before bed. Alternative: Substitute warm water for the milk and add 2 T raw apple cider vinegar for a drink like mulled cider; this adds a probiotic element if the water isn’t too hot, and is also particularly beneficial for pregnancy-induced heartburn and reflux as it helps balance stomach acidity. 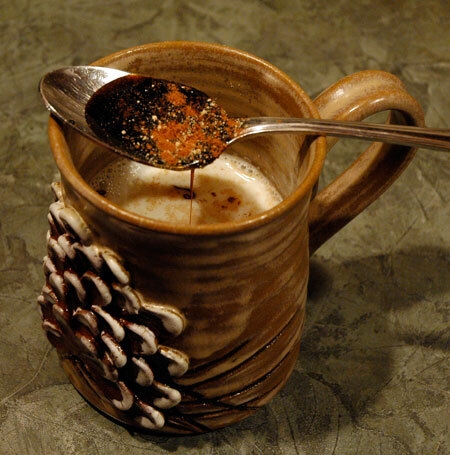 Another nutritious beverage option in which the molasses demurs to a facade of hot cocoa; it can, however, be drunk chilled as well! Combine the milk (or alternatives) and chia seeds in a small saucepan; heat until steaming. Pour into a blender with remaining ingredients, and blend until very smooth. Serves 1.